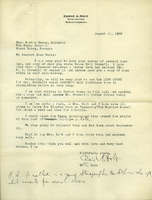 A. Holt is responding to Miss Berry's letter and the copy of the letter she wrote Grace Noll Crowell. He encloses a copy of a letter he wrote to Mr. Crowell. He is excited to see the article of Mrs. Crowell's life that Harper magazine will be publishing. He then discusses his travel plans and suggests he could visit Berry in October. Harper & Brothers ask Miss Berry to become a reader of Harper's Magazine for $1 for six months.